The Henley Park Hotel is one of those few gems in Washington, DC that still stands like it did in yesteryear. It establishes itself silently and serenely on one of the busiest streets in Washington. When you enter the hotel you're cut off from the hustle and bustle of DC and can finally, and maybe seldom, relax. The hotel was originally built in 1918 as the upscale Tudor Hall Apartments. These apartments were home to Washington's social elite and well-known politicians. It was, as the name aptly states, built in a Tudor-style architecture. Its goal was to mimic England's manors with grand archways, leaded-glass windows, and Mercer-tiled floors. The building is also home to 119 gargoyles. In 1982, the property was converted to an upscale hotel, The Henley Park Hotel. Henley Park retains many of its original features and is a proud member of the Historic Hotels of America. The architectural features that are still original include archways, moldings, and leaded-glass windows. 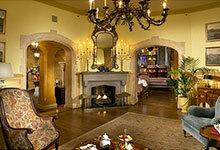 Today, it is a beloved 96-room boutique hotel that has lots of charm. Upholding old traditions is one of their promises. One of their greatest traditions is formal tea that is served everyday in their Wilkes Room. If you want an event, a hotel, or simply a drop-in for tea, Henley Park Hotel is your destination.